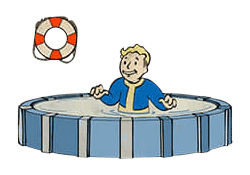 Aquaboy is a Perk in Fallout 4. It is associated with the Endurance Stat. Rank 1: Water is your ally. You no longer take Radiation damage from swimming, and can breathe underwater. Rank 2: You become literally undetectable while submerged.